Small warning: This whole style is waaaaaaaaaaaay out of my comfort zone. 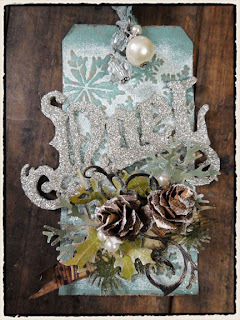 Nothing intimidates me more than anything in the style of Tim Holtz. Anyways, his whole 12 days of Christmas tags started today, and I thought I would at least give it a try! I actually own the same embossing Snowflake folder he used, so at least I had that! I heat embossed the tag with white 'snow' and gently went over it with my Tea Dye ink. 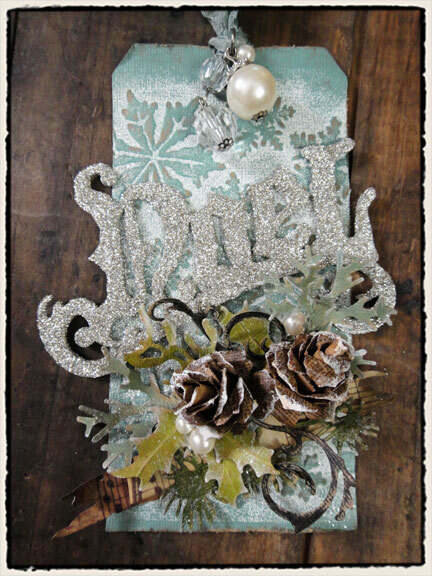 The 'noel' was cut with my Silhouette SD and glittered. I just made a quick half rosette (the paper is soft and fuzzy! ), crinkled some music note paper, and added two fake berries I found in the Christmas decor stash. For this tag I needed to revert back to 'me' style. So this is a fun and bright one. I inked the folder blue, then ran my paper through it. I crinkled a teal paper scrap and then went over it with blue chalk ink. Added some lame paper flowers, another berry, lots of glitter and done! The 'joy' was also cut with my Silhouette SD. My final tag for the day! Surprisingly, this one ended up being my fave. I inked my embossing folder with Tea Dye ink, ran my grey cardstock through to emboss, then border punched the side. Crinkled the music note paper, cut 'joy' with my Silhouette SD, added three paper flowers, and again with the berries (and a leaf!) from last year's Christmas decor stash. I love these! The Joy tag is so pretty! Wow! Great job for your first try!! I'm intimidated by that style, too. These are way lovelier than the stinky socks card I made!! Ha! Thanks for the nice comment on my blog. You did awesome girl!!! I know what you mean about being intimidated by his style, but you can do anything you allow your imagination to do!! You did awesome my friend.